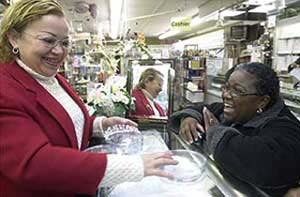 Elizabeth Llorente of The Record, in Hackensack, N.J., journeys to the center of seismic demographic shifts in two series out of Bergen County — Diverse and Divided and A Tale of Two Cultures. In both series, Llorente helps readers see the common human threads that connect all stories of change. She shines a light on the often invisible lines that separate fear and bigotry, perception and reality, legitimate anger and ignorance-inspired bitterness. Her stories showcase a new way to deploy the prism through which so many journalists look at stories of immigration and other racial/ethnic change. She shows how strong, deep, on-the-ground reporting, informed by research and bolstered by the conscious development of key sources, can take a journalist past cliches, platitudes and shallow suspicions and into the undiscovered core of demographic change. 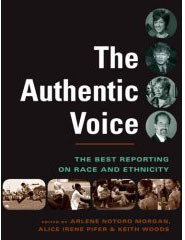 Part 1 of Diverse and Divided and Tale of Two Cultures can be found in The Authentic Voice book and DVD. Read the rest of the series here. At a time when suburbs are seeing their greatest diversity ever, many who left Paterson, N.J., find that the American dream, especially when pursued outside urban areas, brings its nightmares. Professional and financial success, they learn, often do not bring acceptance. The growing bond between the two immigrant groups – the Koreans and the Guatemalans – underscores how so many towns in North Jersey have changed. It is an alliance between two groups that have been – at different times – at the core of ethnic conflicts with Palisades Park’s white residents. New Jersey’s immigrant population, more than 1 million strong, is the nation’s fifth-largest — and its most diverse. But, until recently, day laborers were a rarity in North Jersey. Now, Bergen County alone has upward of 500 day laborers, most of them illegal aliens who live in the area and get jobs building homes, mowing lawns, laying tile. Palisades Park pharmacist Anthony Giannantonio hired two Korean pharmacists. He found out how to say hello in Korean. He put up Korean-language translations throughout the pharmacy. He made donations to the Korean church and to charities. Find out how his reach across the ethnic divide surpassed his pharmacy. Reporter Elizabeth Llorente shines a light on the often invisible lines that separate fear and bigotry, perception and reality, legitimate anger and ignorance-inspired bitterness in her series for The Bergen Record. She shows how strong, deep, on-the-ground reporting, informed by research and bolstered by the conscious development of key sources, can take a journalist past cliches, platitudes and shallow suspicions and into the undiscovered core of demographic change.